After two wonderful days exploring Fort Lauderdale we were excited to be joining Silverseas Silver Spirit for a 10 day cruise around the Western Caribbean and Central America. We arrived at the cruise terminal just after midday and were quickly and efficiently welcomed on board with a glass of champagne into the heart of this beautiful ship which would be our home for the next ten days. Check in was largely carried out on board the ship meaning we were able to familiarise ourselves with the customer relations desk and staff located on deck 5. Embarkation complete we made our way to get some lunch and wait for our suite to become available. We didn’t have to wait long, just after 2pm an announcement was made that our suite was ready. What better place to wait for our suite to be ready than the beautifully serene outside deck of the Panorama lounge? Reception desk, very rarely any queues and always a smiling face. Silver Spirit underwent a major refurbishment in May 2018 which involved the insertion of a whole new section of ship thus increasing capacity, as well as a general ‘musification’ of the entire internal areas to bring her in line with her younger sister, the Silver Muse. This refurbishment was clearly evident in the suite, which was beautifully appointed with lovely light cream contemporary furnishings. We hadn’t had long to explore our suite when our doorbell rang and our luggage was delivered, quickly followed by our butler to welcome us, show us round the room and open our bottle of champagne. We unpacked, enjoyed a glass or two of bubbly on our sun soaked balcony and waited for muster. After muster it was off to the Panorama Lounge for a welcome from the Cruise Director, introduction to some of the staff and brief performance from the Silversea singers. As the evening was drawing in we just had time to quickly get changed before our reservation in La Dame restaurant. After a delicious meal and an exciting day we were well and truly ready for our beds. Pre-sailaway champagne on our balcony. La Dame beef bourguignon, one of nicest plates of food i’ve ever eaten. One of the delicious desserts in La Dame. We started our second day early, both still suffering from jet lag, so thought we would visit the gym before breakfast. The gym opens every day at 6am and stays open until 10pm. 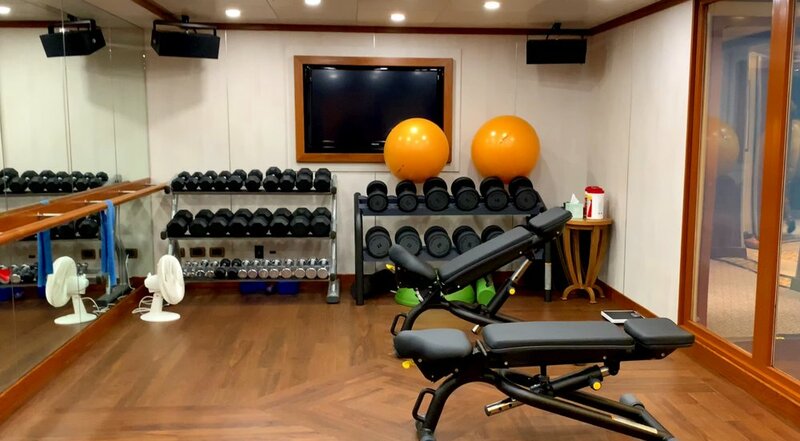 It is relatively well equipped for a small ship and features a separate weights room which is great for those wanting some extra space to do some freestyle exercise. After our workout we decided to take a leisurely breakfast in La Terazza, the buffet style restaurant at the aft of the ship on deck 7. 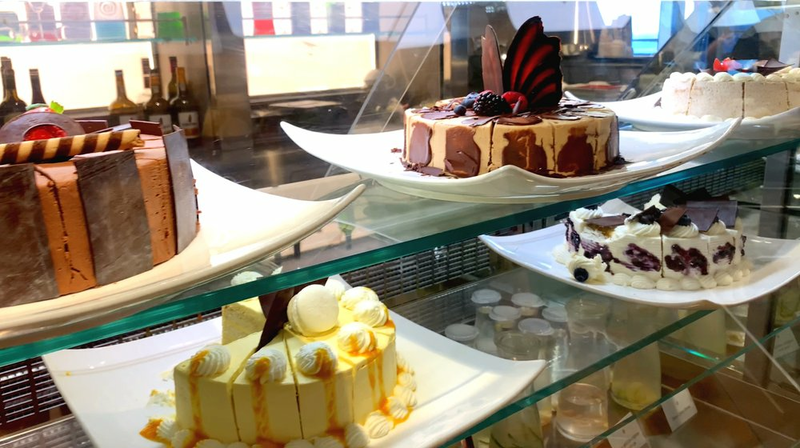 The buffet offers the usual cold meats and cheeses, a wide variety of pastries and breads, cereals and muesli, hot breakfast food and an unusually large and varied delicious array fresh fruits and berries. Waiters are also on hand to take orders for omelettes, pancakes, waffles and other fresh egg breakfasts. The fresh fruit selection each morning for breakfast was amazing. Breakfast over it was off to the pool deck to grab a sun lounger. Now I have a bit of a ‘thing’ about comfortable chairs and loungers on pools and am obsessed (much to Rich’s annoyance) with going round all the public areas and trying out the seating to find the perfect spot. So often these days interior designers seem to choose style over substance and forget that us passengers are on vacation so want to be able to relax. But I can honestly say that I have never been on a ship with so many comfortable seating options and the sun loungers are no exception with beautiful padded cushions on every one. 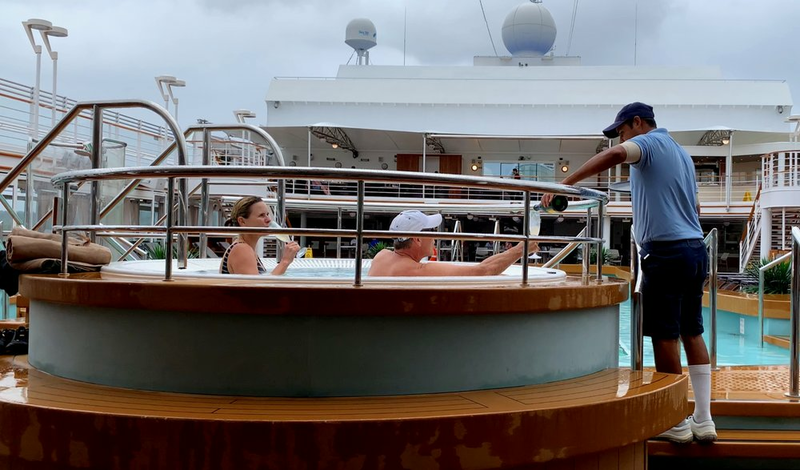 Although we had been on the ship less than 48 hours I had already worked out that the hotspot for loungers by the pool were the double loungers situated under the overhang at the jacuzzi end of the pool. However, there were only 7 of these loungers and they were often reserved from very early in the day with people staying put for the entire day, and other than this area finding a lounger in the shade could be quite difficult. After a couple of hours rest we decided to take an early lunch in Spaccanapoli, the outdoor pizza restaurant, and as to be expected on an ship with a long Italian heritage, the pizzas are pretty awesome. Lunch over we returned to the pool deck for an energetic afternoon of hot tubs, swimming, water polo and sunbathing! That evening was the first formal night and Captains cocktail party, held in the Dolce Vita lounge, so we donned our glad rags and made our way to meet the senior officers and some of our fellow guests. The Dolce Vita lounge quickly became a favourite early evening venue for us with a wonderful cocktail menu, delicious canapés served every evening and two very talented musicians providing the live musical backdrop. As it was formal night we decided to eat in one of the two main dining rooms, Atlantide, which is a steak and seafood restaurant. One of the things about the restaurants on Silver Spirit which we found quite unusual was that the menus don’t change. There is a choice of 8 restaurants to eat in of an evening, so there is plenty of choice, but the menus for each restaurant stay the same every night. 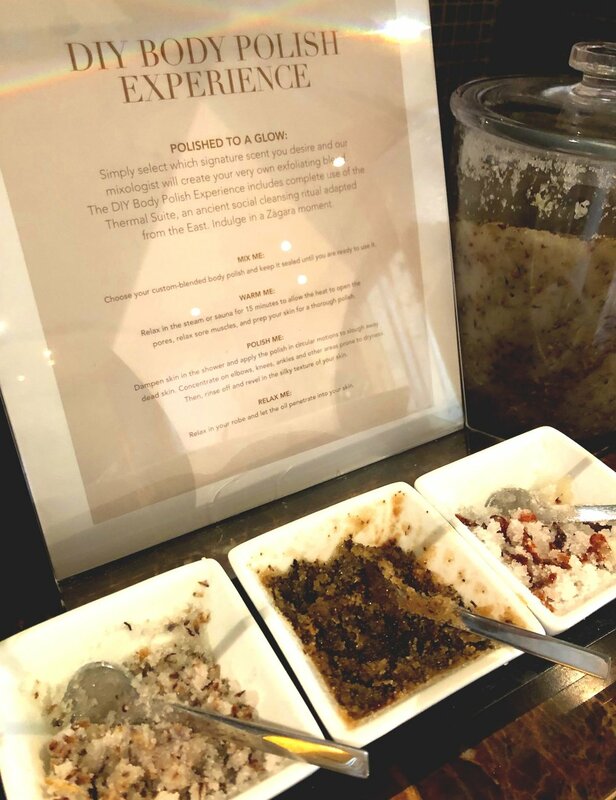 Whilst we never found this to be an issue (in fact it often helped us make our decision as to where we would eat) I could imagine that if you were on an extended voyage you may crave some variety in menus. That said the meal in Atlantide was delicious and even though it is a steak and seafood restaurant and I largely choose vegetarian options there was still plenty of choice for me. After a leisurely dinner, we made our way to the Venetian lounge for the show featuring the Silversea singers which this evening had a ‘swing’ theme and featured all 6 of the singers. Cocktails in the Dolce Vita lounge. The ever changing tray of canapés. The talented guitarist in the Dolce Vita lounge. A mouth watering steak from Atlantide restaurant. The divine lemon meringue dessert served in Atlantide restaurant. The female singers performing in the Venetian Lounge. The next day we awoke bright and early (still jet lagged!) and went to watch our approach into Cozumel whilst eating our breakfast on La Terraza outside terrace. 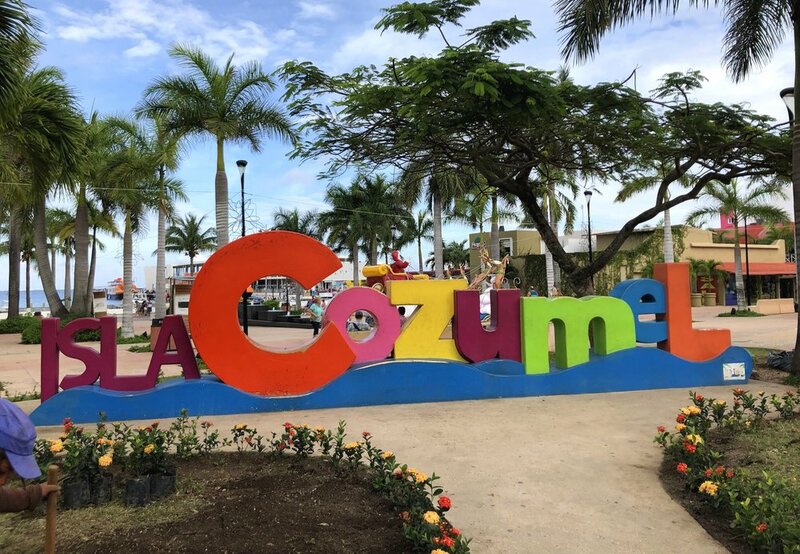 After breakfast we made our way down to the shore excursion desk to speak to the local representative about where to go in Cozumel. Where possible Silversea invite a tourist advisor on board the ship for a couple of hours in the morning to offer help and advise about what to see and where to go before you even step off of the ship. We always use this service if its available even if we have a rough idea of what we want to do, they often give you useful tips or ideas for things you would never have found out on your own. And in busy ports like Cozumel it really helps to get this advise on the ship rather than in port. 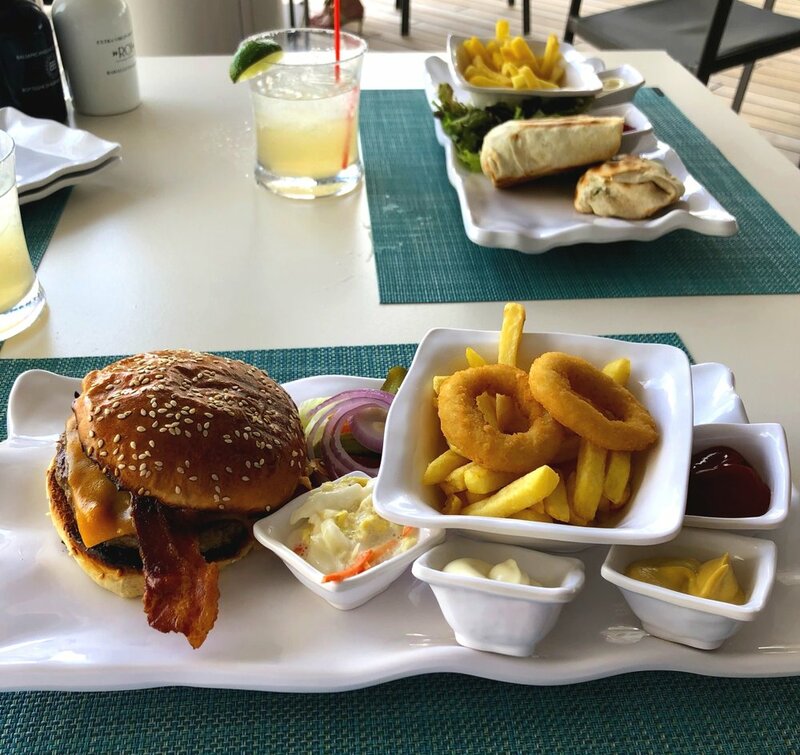 After a couple of hours wandering around colourful Cozumel it was back to the ship for lunch at the Grill restaurant located on the pool deck, and since we were in Mexico we accompanied our lunch with a couple of rather potent margaritas. That evening we had a reservation for Seishin, the Japanese restaurant named after the Japanese word for Spirit. We started our evening in the Panorama lounge, where the ship’s band were playing and plenty of people were enjoying a pre-dinner dance, with the female guests keeping the two male dance hosts busy. The cocktail menu in the Panorama lounge is slightly different to the one in the Dolce Vita lounge which gives a bit of variety to each venue - but of course you can always ask for cocktails not on the menu. And I have to say that in the canapés wars the Panorama lounge won for us, with an entire plate of delicious canapés presented to us to share whilst we drank our cocktails. Two cocktails and a plate of canapés later we made our way to Seishin where we were greeted with a yet another drink, a rather wonderful Saki cocktail served in the most amazing octopus-shaped glass. After a delicious meal and probably a glass or two too many the only option was to roll back to our room and retire to bed! The Panorama lounge was a popular venue for pre and post-dinner drinks and dancing. A sample of some of the cocktails on offer. The chefs suggestions for Seishin dinner. Mouth watering delicious King Crab Tempura. Surf and turf Seishin style. Silversea really do make delicious creme brûlées - this was a passion fruit one . The next stop was Belize and being on excursion we decided to grab a quick breakfast and coffee in the Arts Cafe which was by now our favourite day time venue. This is an absolute gem of a place with amazing teas and coffee served all day long and delicious snacks which constantly change depending on the time of day. And not only does it look funky, the seating is amazingly comfortable, as close to my own living room furniture as I have ever found on a ship. My only complaint was that whilst I absolutely loved the outdoor seats, one half of the outside area was allocated as a smoking area which could be quite off putting for us non-smokers. The funky (but less comfortable) end of the Arts Cafe. You could eat a different piece of cake every day for a year and never try them all! Afternoon tea Arts cafe style. With our breakfast eaten we made our way to the Venetian lounge to wait for our tender to take us ashore to join our excursion snorkelling on the Belize barrier reef, the second largest barrier reef in the world and a UNESCO world heritage site. Once ashore we boarded another boat for a half hour fast ride out to the reef where we donned our snorkelling equipment and made our way off the boat. We were surprised by how shallow the reef was in places and unfortunately for us the tide was low making the sea quite murky and fish scarce. But we enjoyed an hour on a guided swim around this amazing reef before making our way back to the boat for lunch and a lazy afternoon relaxing around the pool. We hadn’t made a dinner reservation for this evening so after some deliberation over our pre-dinner cocktails we decided to try La Terazza, the day time buffet restaurant which transforms into an Italian restaurant in the evening. It is worth mentioning at this point that we never had to wait for a table in any of the restaurants we went to, regardless of whether we had a reservation or not . After a delicious and authentic Italian meal we could do no more than make our way back to our room for a good nights sleep, but not before we remembered to fill in our breakfast card for the next morning. In true Silversea style our butler rang our doorbell promptly the next morning to set out our table for breakfast and what an indulgence it was! I have to say this was the best in suite dining I’ve ever done, with the lounge area transformed into a very comfortable dining area. 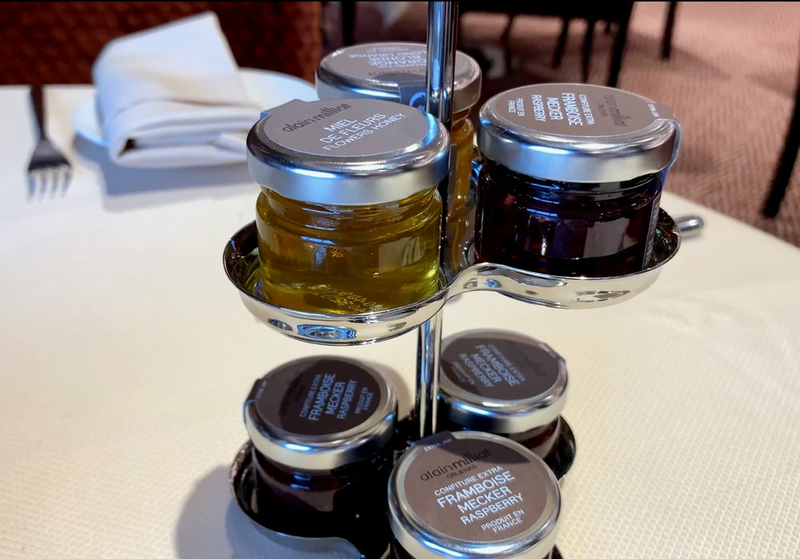 and if ever you get to sail with Silversea make sure you try the Belgian waffles at least once, they are as close to those you would get in Bruges as any others I have tasted at sea. 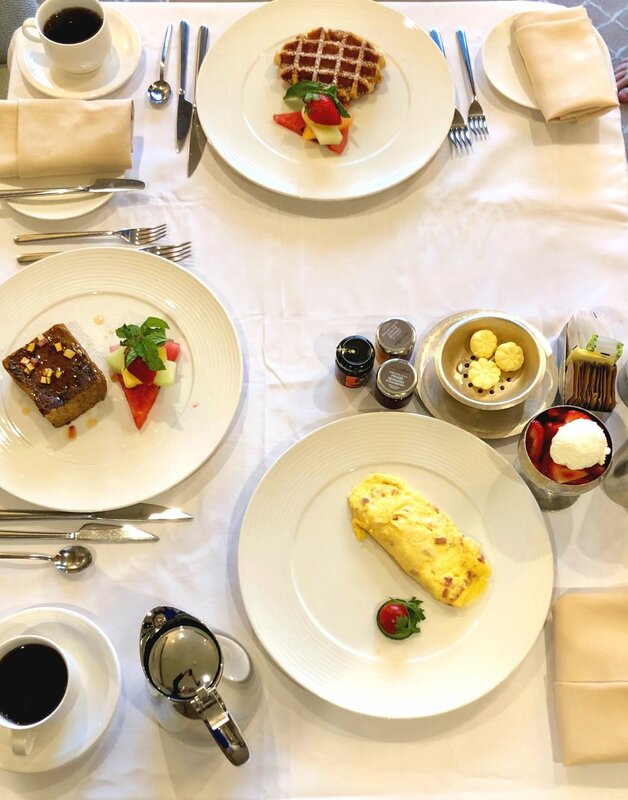 Our in suite breakfast, laid out by our butler. Whilst we were enjoying our breakfast we pulled into a very grey and slightly chilly Guatemala. We decided that since it really wasn’t the best weather for exploring we would purchase a day pass to the thermal spa instead. For a small charge guests can access the hot stone beds, steam room, sauna, body scrubs, and the large jacuzzi which is located on a small private outside deck with loungers for spa guests only. Having enjoyed our Seishin meal so much we decided to revisit it for lunch when it serves delicious traditional sushi prepared at the sushi bar in the centre of the room. Lunch over, we made our way back to the thermal suite for round two of our spa day, which I then decided to round off with an early evening stretch class. Silversea offer complimentary classes such as yoga, pilates, abs, and bums and tums at least twice a day, sometimes more. They are led by the on board fitness instructor and held on the outside deck at the back go the gym and even though i’m not a massive fa of any form of exercise, there was something truly magical about taking a class on the open decks as we sailed away from Guatemala with the sun setting. 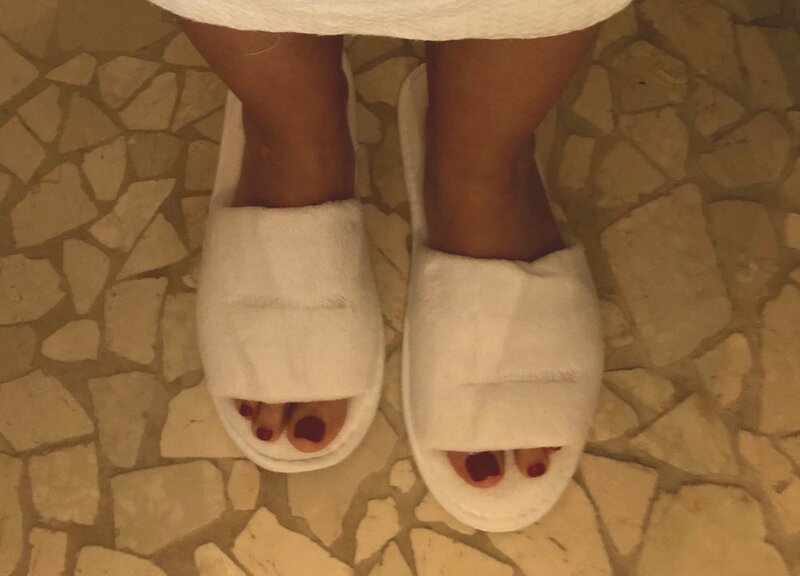 These spa slippers were the softest slippers I have ever worn. 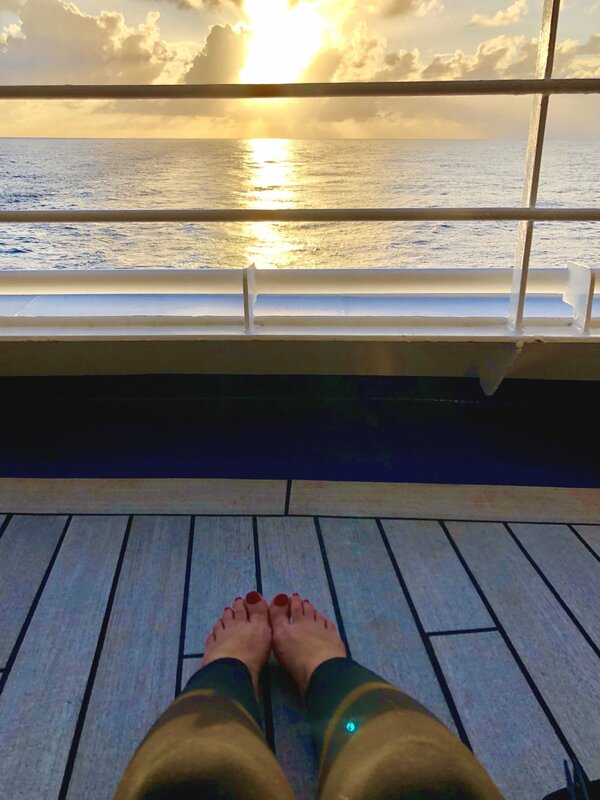 Pilates on the outside deck as the sun sets. That evening we decided to visit the Tors observation library for our pre-dinner cocktails. Whilst this bar was generally always quiet on our voyage, where it was dark by 6pm every night, I can imagine that on hot summer nights in the Mediterranean, where the days are longer, this bar is a lot busier, especially for those magnificent sailaways from places like Kotor or the Norwegian fjords. After our cocktails we made our way to the pool deck for our Hot Rocks dinner. Thankfully the evening had warmed up a bit and the wind had dropped so there were plenty of people eating outside and the place had a really nice busy vibe about it. The evening entertainment in the Panorama Lounge was Liars club featuring the assistant entertainment director and three of the Silversea singers. We always enjoy Liars club and this was no exception with the bar staff having to hastily bring in extra chairs to accommodate guests attending this popular event. The beautifully lit pool deck at night. 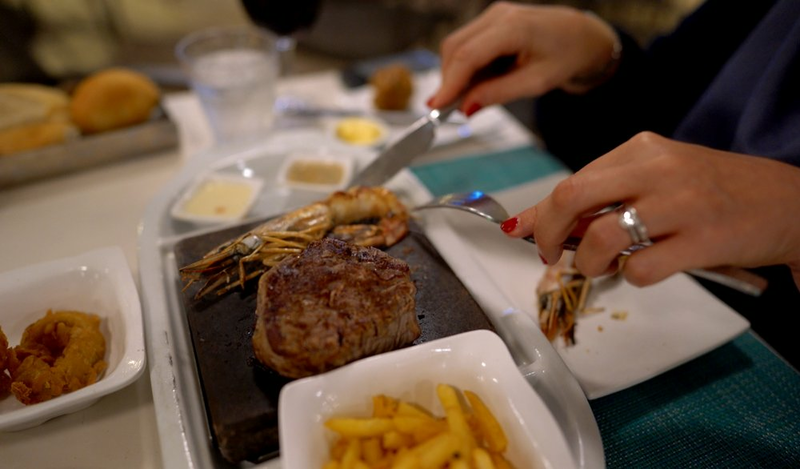 Filet Mignon and King Shrimp cooking on a lava stone. The very yummy New York cheesecake at Hot Rocks. The next day we woke later than usual so decided to take breakfast in the Atlantide restaurant. We were one table of only about five tables seated for breakfast so it was a very quiet, relaxed breakfast with amazingly attentive service. The menu is the same as the room service breakfast menu and you can order as much as you like in whatever order you like. Unfortunately the weather was against us today with a chill wind and pretty persistent rain so we decided to stay on the ship and relax in our favourite indoor venue, the Arts Cafe. After lunch we managed to find some sheltered loungers by the pool and did the only thing you can do when it’s raining in the Caribbean, took to the hot tubs with a glass of champagne in our hand. Hot tubs and champagne, the perfect combination. Dinner that evening was at Indochine, the Asian- influenced dining room, which was my personal favourite restaurant on board, making it even harder to resist eating too much to save myself for the chocolate buffet happening later that evening. 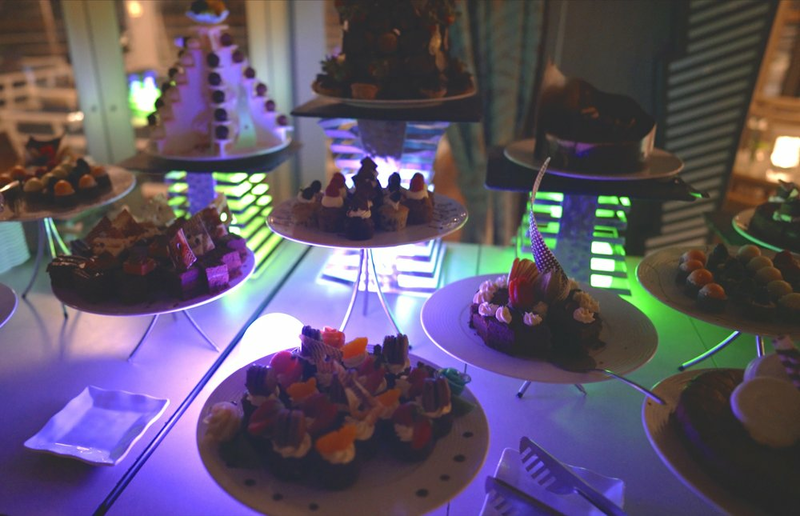 For any chocoholics out there this is heavenly, with an amazing array of chocolate desserts, treats and truffles as well as chocolate martinis, all accompanied by a performance from the singers and music and dancing from the resident DJ. We were pleasantly surprised by the popularity of the late night entertainment with plenty of people staying up late to dance the night away. And if you manage to stay awake beyond 11pm we thoroughly recommend ending your evening in Silver Note, the late night ‘jazz’ venue which has a real basement blues club feel to it, where Esther and Chantal took our requests and entertained us with their wonderful take on some classic jazz/blues songs. My favourite dinner, lamb rogan josh curry. The wonderful Esther and Chantal entertaining us with awesome live jazz and blues in Silver Note. The next day was a sea day and we finally awoke to some real Caribbean weather so I ventured out to the pool deck to start my day with a walk around the jogging track. Although Silver Spirit is a relatively small ship with a small entertainment team we couldn’t fault them for putting on day time entertainment, especially on sea days, and todays highlight was a martini masterclass in the Dolce Vita lounge where we were treated to 3 sample martinis and some tricks of the trade. And if you prefer more solitary entertainment we have to praise the amazing connectivity available on board with wifi access, which seemed to work just as well out at sea as it did when we were in port. Silversea offers all guests a basic complimentary package but if connectivity is important to you I would thoroughly recommend signing up for their premium package which for a very reasonable cost allows unlimited internet for up to two simultaneous devices, meaning you only need to pay for one of you to be connected. Extra devices can be added for a one off charge but we found that having access to one device each was more than adequate. The often deserted upper deck jogging track. Our 3 martinis - the Silver Spirit, Cosmopolitan and Tiramisu martini. The following day we arrived in beautiful Grand Cayman where we were booked on a tour to Stingray City sandbank. If you ever get the chance to do this I would wholeheartedly recommend it, although it is a bit of a tourist hot spot it is well worth visiting. The sand is so soft and the sea so clear and it is just amazing to walk around, doing the Stingray shuffle, letting the rays swim round your feet, brushing over your toes and round your legs. On our way back to land we stopped on the barrier reef for some snorkelling, which was the the best snorkelling we have ever done (to date). 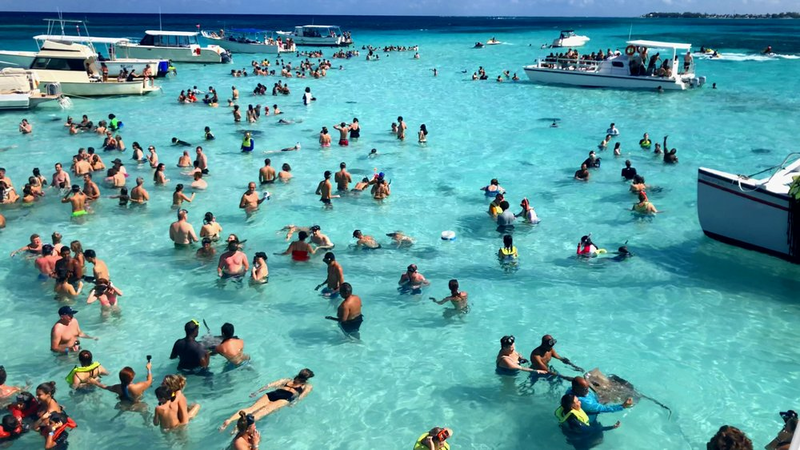 Stingray City sandbank - a tourist hot spot. A stingray swimming round our feet. Apparently kissing a stingray brings 7 years good luck! Snorkelling in the beautiful Cayman Islands. Since we were tired from the excitement of our excursion we had decided to take our dinner in our suite tonight. Twenty minutes after phoning through our order for dinner Prabath, our butler, came to prepare the table, deliver our food and pour us a glass of champagne. We then decided to settle down in our room to finish our bottle of champagne and watch a movie. It’s very rare for us to spend an evening in our suite (in fact I don’t think we’ve ever done it before on our 20+ cruises) but we really enjoyed just chilling and watching a movie in the comfort of our very lovely suite. Pre dinner caviar and champagne. 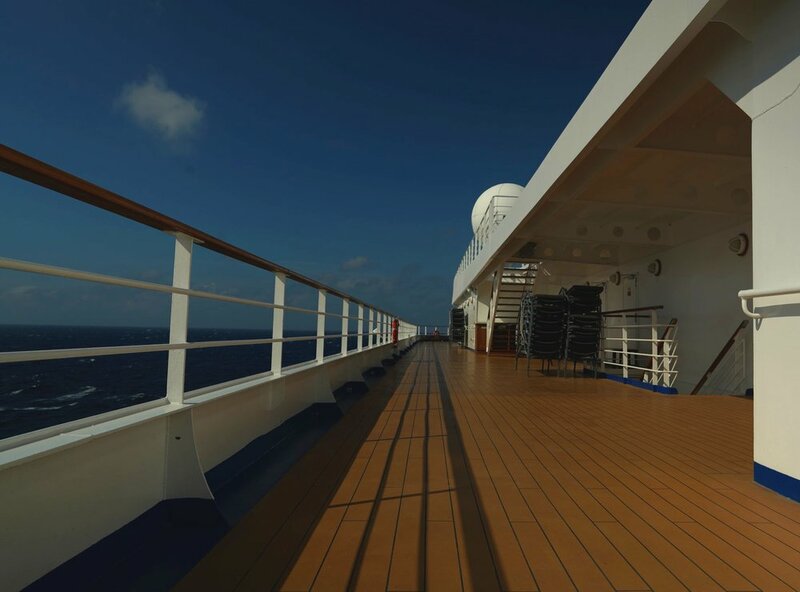 With our voyage drawing to a close we spent our last sea day relaxing and pondering on our first experience on Silversea. Despite the unseasonal weather we had an amazing time and absolutely loved this little ship. We particularly loved the abundance of comfortable seating in public areas and the padded sun loungers; the wonderful staff who can’t do enough for you (with a special mention to the intuitive butlers); the number of different dining venues and quality of food on offer (especially afternoon tea in the Arts Cafe); our beautiful and spacious room with a fabulous TV system; and reliable and fast wifi connectivity. And what better way to spend our last evening of this fabulous voyage than by ordering champagne and caviar in our suite to enjoy whilst we prepared for dinner. For our last evening on board we were booked into the only restaurant we had yet to eat in, Silver Note. This tapas style ‘foodertainment’ restaurant combines eating and entertainment, which as foodies and jazz and blues fans we loved. 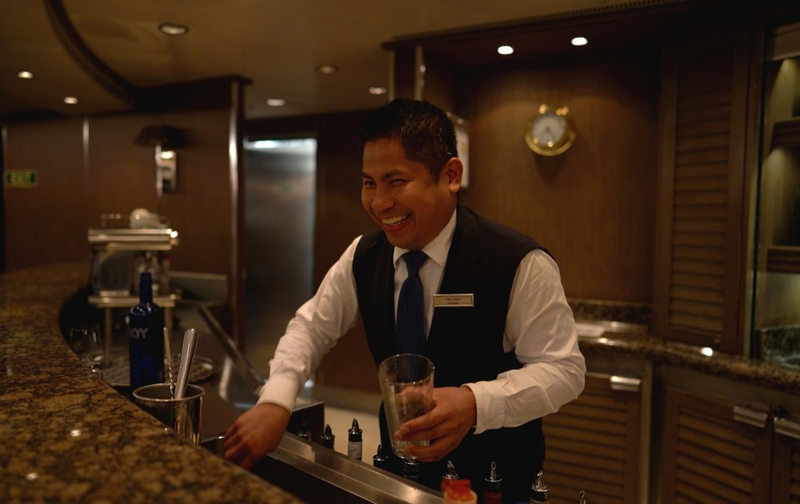 Overall we could find little to fault with this luxurious ship and its amazing crew and we and look forward to sailing with Silversea again, very soon! 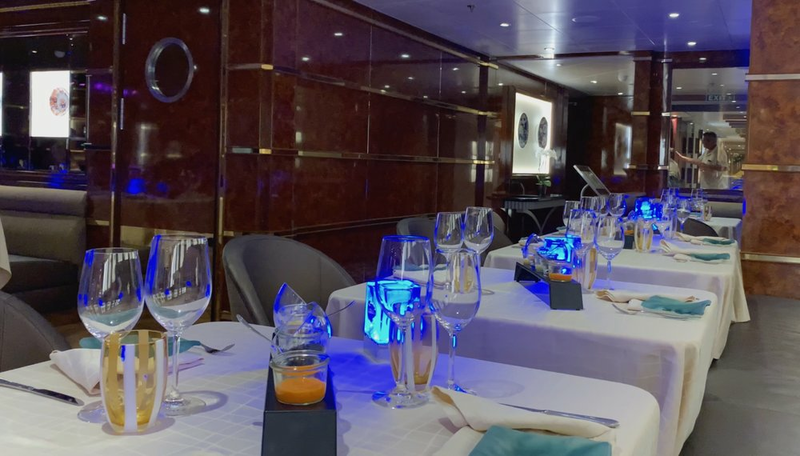 If you would like to read more on Silversea’s Silver Spirit look out for our suite and dining guides coming soon or take a look at our ship tour and review on the Silver Wind. Thanks to Silversea Cruises for inviting us on this Caribbean voyage to experience their newly refurbished ship, the Silver Spirit.